We have a SPECIAL addition to our Portland Market! 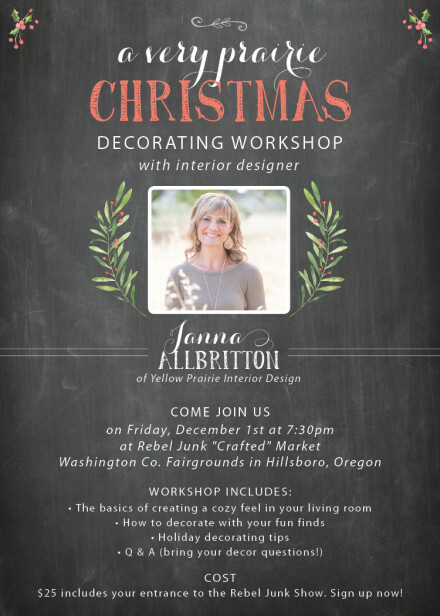 Janna Allbritton of Yellow Prairie Interior Design will be our special guest on Friday night for a very prairie CHRISTMAS decorating workshop! Friday night, December 1st at 7:30pm during the Rebel Junk "Crafted" Market. $25 includes your entrance to the Rebel Junk Market and workshop! Come enjoy the market at 5:30pm... shop, listen to live music and have some wine! The decorating workshop starts at 7:30pm!